The Philips HeartStart Home AED Defibrillator is designed for the ordinary person in the extraordinary moment. This defibrillator guides you through the process of treating a victim of suspected sudden cardiac arrest. The OnSite AED provides real-time guidance through step-by-step voice commands and CPR guidance. The AED also comes equipped with integrated adult AED SMART pads, which provide feedback to the defibrillator so it can adapt its voice instructions to your pace. 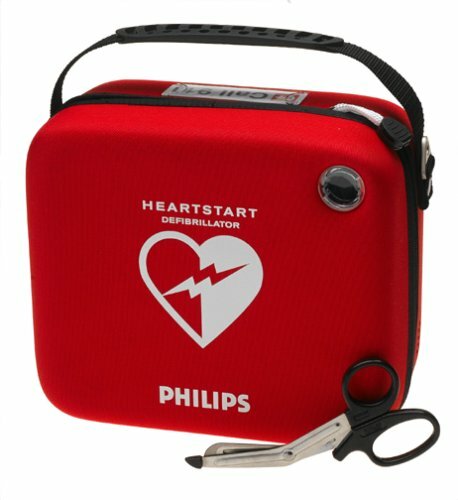 To give you confidence in your ability, you also can install a special pads cartridge (sold separately) that temporarily turns your OnSite defibrillator into a trainer.By having an AED defibrillator for home use, you can better prepare yourself for emergency scenarios--and potentially help save the life of a family member, friend, or any one suffering from a suspected sudden cardiac arrest. Use OnSite To Train - To give you confidence in your ability, you also can install a special pads cartridge(sold separately) that temporarily turns your OnSite defibrillator into a trainer, or watch our collection of videos that describe every aspect of the defibrillator. 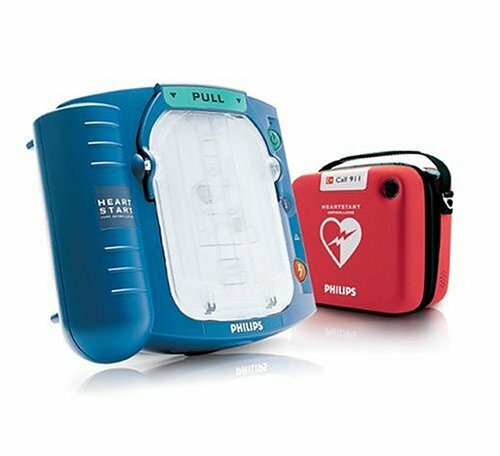 The Philips HeartStart OnSite AED Defibrillator is designed for the ordinary person in the extraordinary moment. This defibrillator guides you through the process of treating a victim of suspected sudden cardiac arrest. The OnSite AED provides real-time guidance through step-by-step voice commands and CPR guidance. The AED also comes equipped with integrated adult AED SMART pads, which provide feedback to the defibrillator so it can adapt its voice instructions to your pace. 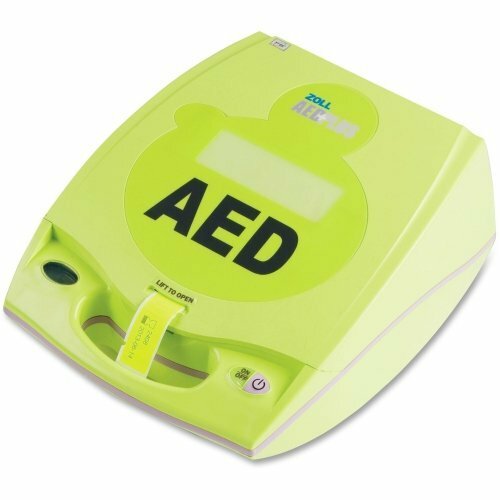 To give you confidence in your ability, you also can install a special pads cartridge (sold separately) that temporarily turns your OnSite defibrillator into a trainer.This AED Value Package comes with a Slim AED Carry Case, which can accommodate a pair of paramedic scissors in addition to the defibrillator. 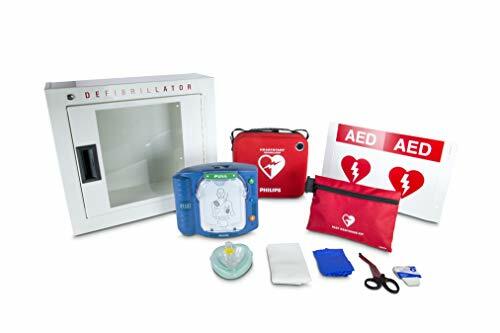 The AED Value Package also includes a 9-inch by 6-inch AED Wall Sign to provide greater visibility for your defibrillator, a Fast Response Kit that contains tools and supplies typically needed for patient care and personal protection, and an AED Wall Mount, designed for placing the HeartStart Defibrillator and its accessories within reach. Conveniently store and transport your Philips HeartStart Home and OnSite AED Defibrillator and its accessories with the Philips HeartStart AED Defibrillator Standard Carry Case. 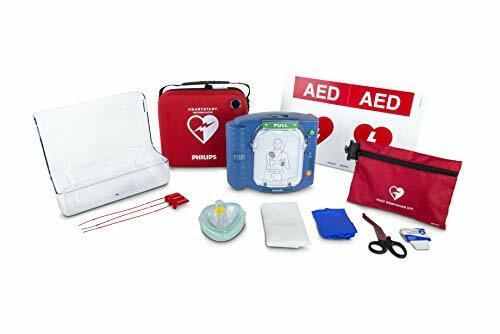 This AED carry case can accommodate one Home or OnSite defibrillator and several related accessories--including one spare pads cartridge, one spare battery, a pair of paramedic scissors, and a quick reference guide. It is constructed with semi-rigid materials and covered in durable red Cordura fabric. The Philips HeartStart OnSite AED Defibrillator is designed for the ordinary person in the extraordinary moment. This defibrillator guides you through the process of treating a victim of suspected sudden cardiac arrest. The OnSite AED provides real-time guidance through step-by-step voice commands and CPR guidance. The AED also comes equipped with integrated adult AED SMART pads, which provide feedback to the defibrillator so it can adapt its voice instructions to your pace. 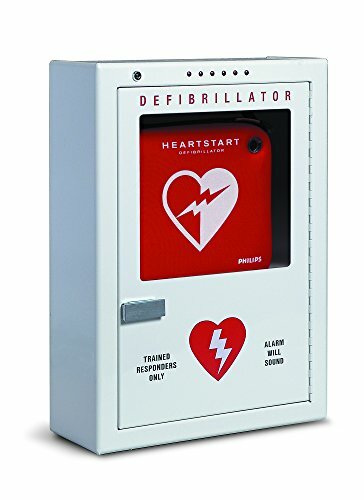 To give you confidence in your ability, you also can install a special pads cartridge (sold separately) that temporarily turns your OnSite defibrillator into a trainer. The Ready-Pack configuration arrives virtually ready to use with adult AED SMART pads and battery already installed. With access to the right equipment and support, everyone can help save a life. 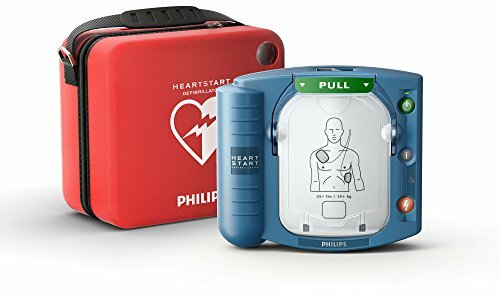 The Philips HeartStart AED Defibrillator Adult SMART Pads Cartridge is designed for use with the Philips HeartStart OnSite and Home AED Defibrillators. It contains one set of adult AED pads appropriate for cardiac arrest victims 8 years and older or those weighing above 55 pounds (25 kilograms). Featuring a convenient "pull" handle, these adult AED defibrillator pads are easily accessed for efficient use and time savings. The cartridge can easily be snapped into the OnSite or Home AED, making replacing your AED pads easier than ever. The AED Plus is the first and only Full-Rescue AED that helps with both defibrillation and CPR. ZOLL's Real CPR Help® technology provides real-time feedback on both depth and rate of chest compressions during CPR. This ensures that the rescuer is providing the best manual CPR possible during a rescue, giving the victim a better chance of survival. 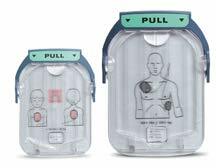 This technology, being the first of its kind, is what makes the AED Plus the only AED that will help make a difference during an SCA rescue. The AED Plus includes the AED Plus defibrillator, CPR-D-padz adult electrode, one sleeve of 10 batteries, and a soft carry case. 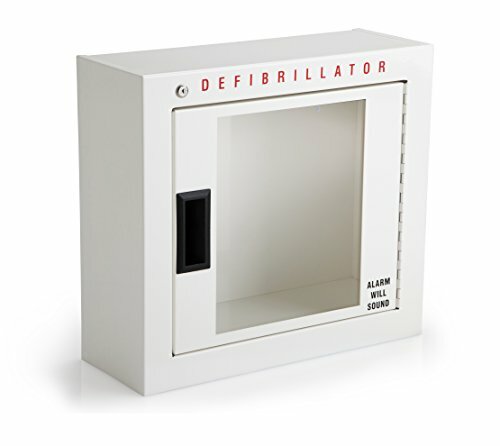 Keep your defibrillator in an easy-to-access area with the Philips HeartStart AED Defibrillator Premium Wall Cabinet. In a lifesaving event, having quick access to the right tools is paramount. This alarmed AED wall cabinet is designed to help mobilize an emergency medical response. Equipped with an audible alarm and a flashing light alarm, it can help deter AED theft and keep your defibrillator safe. This wall surface-mounted cabinet is made of sturdy heavy-gauge steel, and is large enough to accommodate additional medical supplies such as oxygen. You can also connect the cabinet’s alarm to your internal security system so a more coordinated emergency response can be mobilized centrally. Keep your defibrillator in an easy-to-access area with the Philips HeartStart AED Defibrillator Basic Wall Cabinet. In a lifesaving event, having quick access to the right tools is paramount. This alarmed AED wall cabinet is designed to help mobilize an emergency medical response. Equipped with a basic, battery-powered audible alarm, it can help deter AED theft and keep your defibrillator safe. The Philips Heart Start Home and On-site AED Defibrillator Replacement Battery can be used as a spare or replacement battery for the Philips Heart Start Home and On-site AED Defibrillators. This disposable, lithium manganese dioxide battery has a five-year shelf life plus a typical four-year installed life. A spare battery should be stored with the defibrillator at all times. 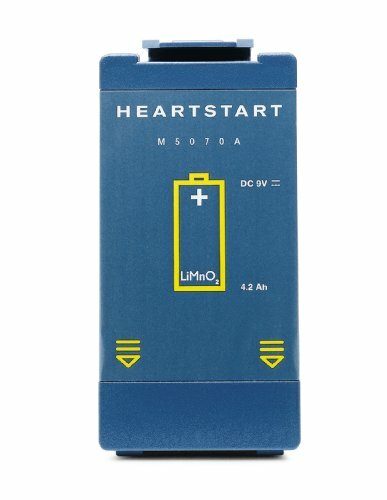 Additional batteries should be purchased for defibrillators used frequently for training or demonstrations.